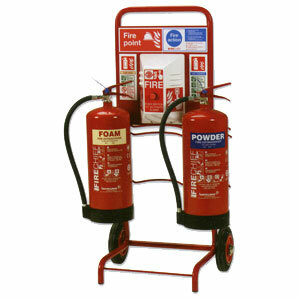 Designed specifically for construction sites the Howler double extinguisher trolley is the perfect option for mobility. It will hold 2 9kg or 9 litre fire extinguishers and has the option to have a Howler Site Alarm fitted via the drilled backboard. It comes fire point signage and the option to fit extinguisher signs also. Designed to withstand the rigours of active use. *Fire extinguishers, Howler alarm and extinguisher signs pictured are not included. These can be selected separately.